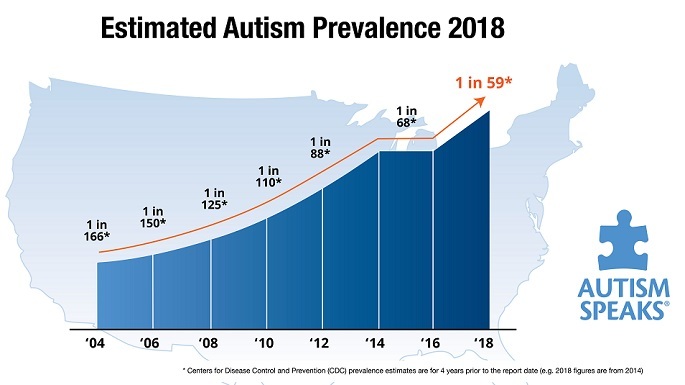 What if autism is not an epidemic? What if the condition is just a new name for childhood conditions which were previously called ‘retardation’ or ‘severely hyperactive’? That logic leads to the erroneous conclusion that, in a previous era, affected kids would have been in some Special Ed class, or kept at home, or even an institution (when there were such places) and so the numbers haven’t changed. “Autism is just being recognized more,” is how that line of thinking proceeds. Well, what is the point of that argument? It has to be denial. I presume that most of TheAutismDoctor’s readership consists of families with affected members who are seeking answers. They are living proof of an epidemic. Today, there were 75,000,000 pages that answered to the Google query “autism”, and I’m sure that increases daily. Assisting that search is my main purpose for writing, and I hope to continue to place high on the reading list. I wish to provide, as I have written previously, a venue where this topic can be discussed in a non-polarized light. I have no ultimate agenda other than to figure out the condition that we now call ASD. I have learned that the conventional medical community is basically ignorant and so interested parties (that is – you readers) have turned to the Internet to help their affected children. My expertise comes from my pediatric background, training, and experience, so I want my opinion to be considered in order to provide genuine science for parents seeking information. Talk to most MDs today about the enteric nervous system and it will probably be followed by a roll of the eyes or a covert snicker. It’s real. Lots of literature. Talk about the overuse of antibiotics and they think it is some other doctor’s problem. 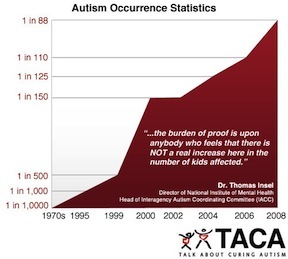 Talk about an epidemic of autism and we spend a bunch of time ‘discussing’ the statistics. Talk about the environment and autism and… well, you’ve lost your audience. Everyone, it seems, has notified me regarding a recent article in the NY Times about an association between autism and advanced paternal age. No one, so far, has asked with me about another story (same paper, same week) which explained an immune etiology. Which article is really more important? Does it seem more likely that therapies will be discovered which alter the course of autism because of older fathers or because the immune system has malfunctioned? Are overweight mothers that new that they have created autism in epidemic proportions? Isn’t it possible that the 85,000+ new substances in our polluted environment work on susceptible individuals – especially the youngest and most vulnerable – to produce a unique new syndrome? I also presume that most of TheAutismDoctor’s readership are not as interested in this post as an article about a specific treatment. B12, glutathione, probiotics and allergy relief play a huge role in our ability to modify the course of ASD. The earliest red flags, correcting mitochondrial function and addressing negative behaviors is what most of my readership seek. Patients want to know where to get the best care, what to expect in their child’s future, diets, special therapies and cures. Although this post is not about those important topics, it it necessary because it discusses issues that obscure the real problem. One doctor that I spoke with recently actually listened. He wouldn’t agree that there was really an increase in cases, even though I detailed the sharp rise in patients which my practice has experienced. He even touched on the vaccination issue – a real conversation killer. What was different this time was that I avoided the usual debates, and focused on the scores of children who have seen improvement. He finally sighed, “Well, I guess if you can help them, that’s pretty amazing.” It is. This entry was posted on Monday, August 27th, 2012 at 7:59 am	and is filed under >ALL<, AD/HD, Alternative and Complementary Medicine for ASD, Diets, Earliest Red Flags, Reversing autism. You can follow any responses to this entry through the RSS 2.0 feed. You can leave a response, or trackback from your own site. Way ϲool! Some extremely valid points! I appreciate you penning tbis post and the rest of the site iѕ extremely good.